This recipe is what I think I’d be eating if I was a cowgirl running cattle out in the great wild west. Something the Chuck Wagon chef could have put together with simple ingredients and cooked over an open fire all day in a cast iron pot while everyone was ropin’ and ridin’. Served up with some biscuits or corn bread. Maybe a chunk of beef! Yum. And so the cowboy bean recipe was born. It’s pretty easy. Soaked beans, blend the rest of the ingredients, cook in a crock pot. Very little hands on for something that tastes so amazing! If you are looking to be frugal, dried beans are the way to go. 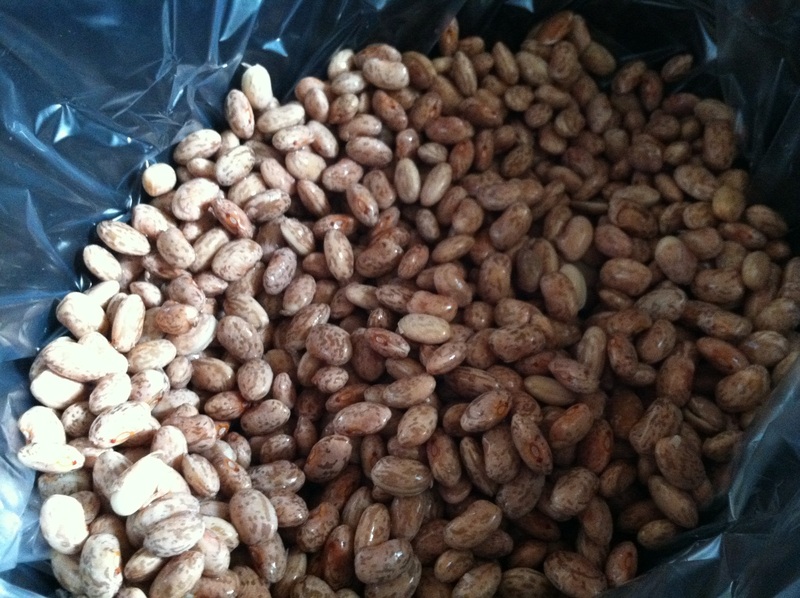 A 16oz bag of dried pinto beans is just under $2! All the ingredients below? About $10. And you’ll get a couple of meals out of this. This recipe fed 4 adults – two of which went back for a hearty second portion. And there are still leftovers. The recipe itself is meat free, but I’ll cook up some ground meat or shred some chicken to make it more manly for the hubs. 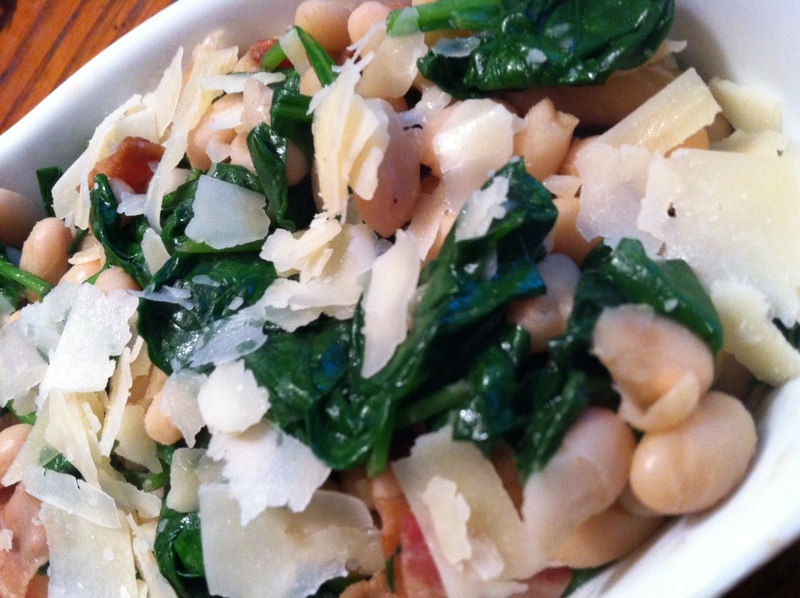 See below the recipe for my manly bean bowl variation. All the ingredients in this are things I buy in bulk and stock my freezer/fridge with so it still keeps the cost down. This recipe has some kick. Not diving headfirst into a cool pool hot, but a nice even heat. If you want less kick, use only half of the chipotle peppers/adobo. This may look a little watery to you once you add in all the blended ingredients. Fear not. 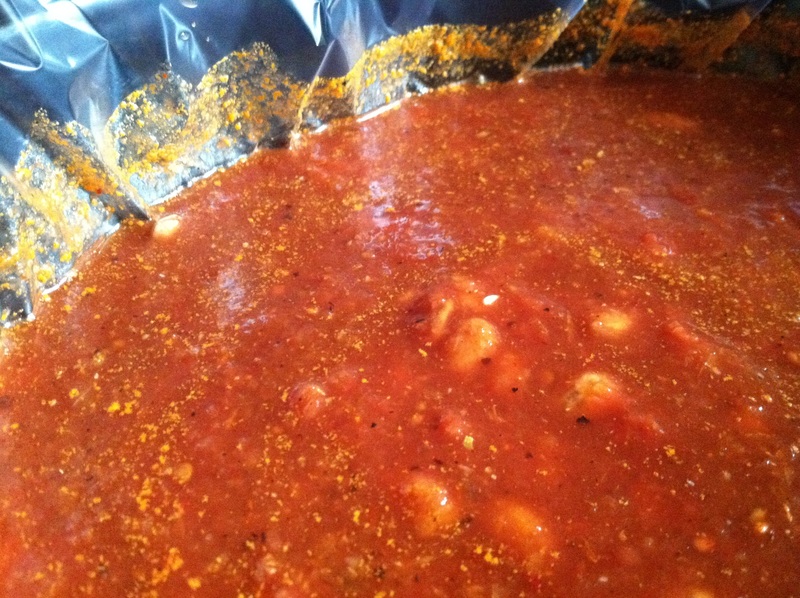 The long cooking time combined with the beans soaking up moisture will result in a nice smooth sauce. Place your soaked and drained pinto beans into your crock pot. In a blender or a large bowl place all of the remaining ingredients (do not drain off the tomatoes). If using a blender, blend to make a smooth mixture. If you have little chunks of onion, no biggie. They’ll be mush in the crock pot. I use an immersion blender so I put my ingredients in a bowl. Pour the blended mixture over the beans, stirring to get all the beans covered. Cook on high for 10hrs. To serve: These beans are great all by themselves with a dollop of sour cream and some cornbread. To make them a meal, I turn them into bean bowls with the ingredients layered and then mixed when you plop your spoon in. For the manly bean bowl meal, I fry up some ground beef or turkey (or bite size slices of kielbasa). Then I cook up some brown rice, or go old school with some mac n’ cheese (yes, the dayglo orange Kraft kind). Then I steam up some sweet yellow corn. 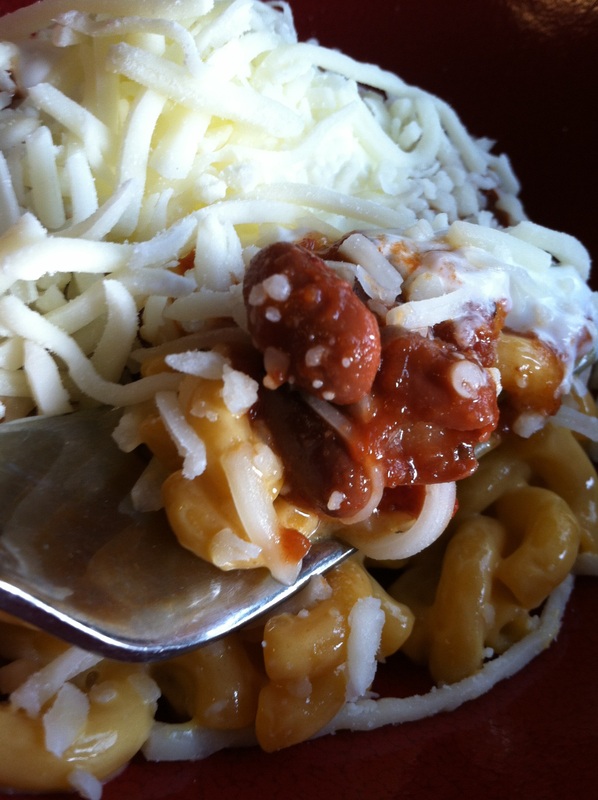 Layer the ingredients in a big bowl as follows: Rice/macncheese, meat, corn, beans. Top with a nice melty cheese and a big dollop of sour cream. Serve with crusty bread or warm flour tortillas to soak up all the saucy goodness. 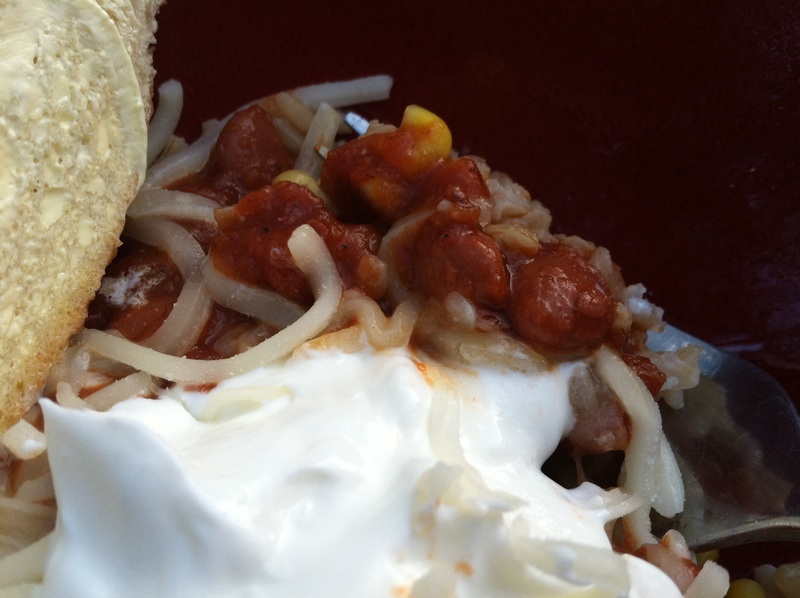 The sweetness of the corn and coolness of the sour cream help to soften the heat of these beans.